Former D.C. Council Chairman Kwame Brown stands in front of the judge in federal court. Former D.C. Council Chairman Kwame Brown should spend six days in jail for lying on bank loan applications and for committing a misdemeanor campaign finance violation, federal prosecutors said Thursday. But a lawyer for Brown requested community service instead, saying his client had already been punished with humiliation and ridicule in his very public descent from power. "His fall, all of his own doing, has been very public and personally painful for him and his family," defense lawyer Frederick Cooke said in a sentencing memorandum filed Thursday. Brown's plea agreement with prosecutors called for up to six months in prison. Prosecutors requested a six-day sentence that would be served during weekends and followed by three years of supervised release. They said they were balancing the severity of the crime against his acceptance of responsibility, cooperation with law enforcement and lack of prior criminal convictions. Brown "has paid a heavy price for his crime, as he should. 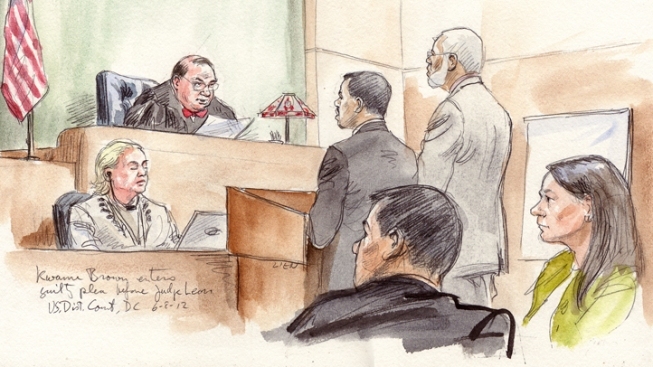 He once was one of the most powerful elected officials in the District of Columbia with strong popular support from the community and a bright political future," prosecutors wrote in their sentencing memorandum. "After sentencing, he will be a convicted felon with no political office ... and he will be unemployed." Brown held the district's second-highest local elected office before pleading guilty in June to providing false information on bank loan applications. One of the loans was for a 39-foot, 330-horsepower boat - "a luxury few people can afford," prosecutors wrote. He became the second sitting member of the council, after Harry Thomas Jr., to plead guilty to federal charges this year. Prosecutors are also investigating the 2010 campaign of Mayor Vincent Gray, and three of his former campaign aides have pleaded guilty. Though Brown forged the signature of a friend on an application and doctored two forms to overstate his income by tens of thousands of dollars, prosecutors said he deserved credit since he resigned his position on the council, pleaded guilty and repaid his loans - preventing any actual financial loss. He also pleaded guilty in D.C. Superior Court to a campaign finance violation stemming from an unreported side bank account opened by a relative during the 2008 campaign. Brown has been free since his guilty plea, but he earned a judge's ire when he failed to make three weekly required phone calls to pretrial services. U.S. District Judge Richard Leon called him into court last month, placing him under curfew and ordering him to make weekly visits with court officials. "Don't violate that curfew, because if you do, there won't be three strikes. There will be one. You don't want to know what the next step will be," Leon told him. "Don't miss those visits. Think you can handle that?"